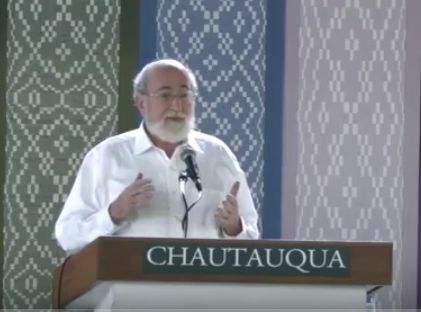 Last Thursday Rabbi Joseph Telushkin, author of Jewish Humor: What the Best Jewish Jokes Say About the Jews, delivered a 45 minute speech at the Chautauqua Institution in upstate New York on The Fifty Best Jewish Jokes and What They Say about the Human Condition. As part of Chautauqua's Week Six, “The Spirituality of Humor,” Telushkin connected humor in Judaism to society at large. The Chautauqua Institution is a non-profit education center and summer resort for adults & youth located on 750 acres in Chautauqua, New York, about an hour from Buffalo. It offers programs in the arts, education, religion and music. We don't usually post such long videos, but we think this one is worth your time. If you don't have 45 minutes to spend on it now, we suggest that you take it in 10 minute bites over the course of a few days. At the end of the lecture, Telushkin takes questions from the audience, whose members used the opportunity to tell some of their favorite jokes. We watched the whole lecture and enjoyed it thoroughly. We didn't count the jokes, but Telushkin easily wove many old favorites into his talk. Labels: Chautauqua, Jewish Jokes, Joseph Telushkin, Standup Comedy, Videos.